The word "organic" is becoming little more than a money-maker for corporations who want to jump on the bandwagon. In fact, the FDA and USDA, which are the very agencies that are supposed to be protecting the organic food supply, are intensely active in its adulteration. A "certified organic" product can actually have a mix of organic and conventional ingredients. In fact, under the law, you could manufacture "organic beer" with completely conventional hops, label it "USDA Certified Organic," and charge a premium price for it -- hops are allowed to be non-organic under USDA Certified Organic products. "It's like putting gasoline in a glass of pure water and charging a premium for that water because it only contains 30 percent of the contaminant. 30 percent contamination is probably better than 100 percent, but would you want to drink it? The whole glass of water is poisoned due to the gasoline, yet the companies selling this product would like you to believe that because it contains pure water it is good." The organic label has become widely popular in the last several years, but unfortunately, there's still plenty of wiggle-room for companies to mislead you. Whereas organic foods were once truly raised naturally, on small farms with great integrity, big business has stepped in and tainted many of the principles upon which the organic label was founded. There's no doubt about it—organic food is Big Business. According to the Organic Trade Association, U.S. sales of organic food and beverages have grown from $1 billion in 1990 to $24.8 billion in 2009. Unfortunately, the quality and meaning of the organic label is undergoing an equally fast and exponential decline. Some of the most obvious organic rip-offs include organic milk and snacks. Because organic milk is NOT raw milk; while it is a plus that it doesn't have added antibiotics and hormones, it is still pasteurized, and therefore still associated with all of the same health problems as regular pasteurized milk. And organic junk foods like crackers, cookies, pizzas and potato chips are still some of the worst foods you can eat, regardless of whether or not the some of the ingredients are organic. Food companies are clearly cashing in on your desire to "have your cake and eat it too," so to speak, and deceiving you into believing that you can eat cookies, ice cream and potato chips without feeling guilty because they're "organic." But the organic label means absolutely nothing here in terms of actually helping you obtain optimal nutrition. Then there's the issue highlighted by Farm Wars above, which is the fact that of all the certified organic labels, most of them can still contain varying amounts of non-organic ingredients that will effectively negate any benefit of the organically-grown ingredients. "If the FDA is here to help us instead of make money for its corporate owners, don't you think this agency would demand that labeling be perfectly clear?" Farm Wars writes. The word "organic" is fast becoming a high-dollar money-maker for corporations smart enough to jump on the bandwagon and start marketing their products as "made with organic ingredients," or "certified organic." Even Monsanto is taking advantage of this burgeoning market, and people naïve enough to believe that what we have traditionally thought of as pure, organic food, is still that way, are being duped. It makes perfect sense, however, in a Machiavellian sort of way. Flood the food supply with poisons, then lead people to believe that the only safe choice left is USDA Certified Organic. Then buy up the organic companies one by one, and start changing the "organic" rules from the inside out via the bought and paid for government agencies so that you can reap the profits from those trying to escape the poisons." That last part is a related concern, as major food conglomerates have bought up many of the most successful organic companies. 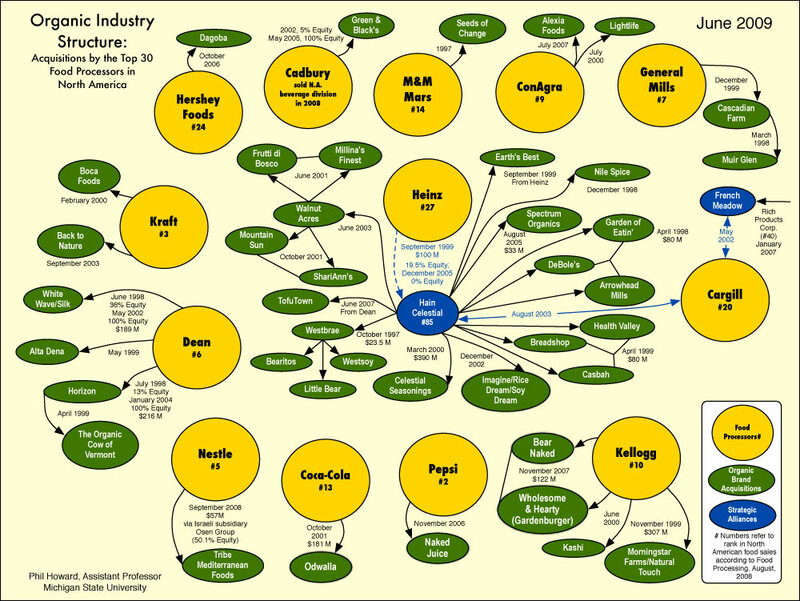 Farm Wars provides a helpful chart showing the Organic Industry Structure as of June 2009. First of all, it's important to realize that there are several different organic labels out there, but only one relates directly to foods: the USDA Organic seal. This seal is your best assurance of organic quality. Growers and manufacturers of organic products bearing the USDA seal have to meet the strictest standards of any of the currently available organic labels. In order to ensure you're actually getting your money's worth, you need to make sure the food you buy bears the "100% USDA Organic" label. The problem with the latter two labels is obvious. Anywhere from five to 30 percent of the ingredients may be conventionally-grown, so you're still exposed to pesticide residues and other questionable ingredients. The "Made with Organic Ingredients" is clearly the most misused and misleading, as it allows for plenty of conventionally-produced ingredients. "The FDA and USDA would like us to believe that using "certified organic ingredients" somehow makes the poisons they allow in the other 30 percent okay, and companies charge through the nose for these adulterated products," Farm Wars point out, and rightfully so. A "100% Organic" product on the other hand cannot be irradiated, and cannot contain preservatives or flavor enhancing chemicals, nor traces of heavy metals or other contaminants in excess of tolerances set by the FDA. It must also be grown and processed using organic farming methods that recycle resources and promote biodiversity—so it encompasses organic in a holistic way, from start to finish. Crops must be grown without synthetic pesticides, bioengineered genes, petroleum-based fertilizers, or sewage sludge-based fertilizers, and livestock cannot be given growth hormones. So, in terms of organic food, there's really only one label that can provide you with any real measure of quality, and that's the "100% USDA Organic" label. Is Neotame Allowed in Organic Food? Farm Wars also brings up the issue of Neotame, which is one of the latest artificial sweeteners on the market, claiming it can be included in products bearing the USDA "Made with Organic Ingredients" certification without being listed on the label. "Neotame, as a synthetic additive, is not allowed in organic foods, contrary to the Internet rumor. … The Food and Drug Administration indeed considers Neotame to be a direct food additive (21 CFR 172.829), but this does not mean that it can be added to organic foods. Organic foods cannot contain synthetic additives, unless these additives have been petitioned and approved to appear on the National List of Approved and Prohibited Substances (7 CFR 205.605). Emily Brown Rosen, Standards Specialist at the USDA's National Organic Program, writes about Neotame: "For organic food, all additives must appear on the National List." Neotame has never been petitioned or approved for inclusion on the National List, and therefore cannot legally be added to organic foods. We see no evidence, and see no reason to suspect, that any organic certifying agents would allow organic food manufacturers to violate the federal standards by adding this synthetic sweetener. Moreover, as a direct food additive, Neotame must be listed on the ingredients label, contrary to suggestions that this could be added to food in a stealth-like manner (21 CFR 101.100). We have not seen any evidence to suggest that Neotame is being added covertly to organic foods. Not only would organic manufacturers be breaking the law by adding this synthetic sweetener to organic foods, they would also be breaking the law by not including Neotame on the ingredient label." For the complete National List of Allowed and Prohibited Substances under the USDA organic label, see this link. As deplorable as this situation is, it's not surprising. Food companies, as any other primarily profit-driven company, simply cannot let such a swelling market niche go untapped. However, if you realize that much of the organic labeling is hype, it becomes easier to navigate around the deception. In fact, many small family farms are actually fully organic even though they may not have gone through the expense of obtaining organic certification. So labels aren't everything when it comes to healthful food.